Welcome to the new MafairUMC.org! The website has been freshened up with new features like embedded photo slideshows and video. We also have better-than-ever email and feed subscription services, so it's easy to sign up and stay current with the latest our site has to offer. 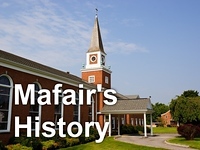 Come visit www.MafairUMC.org often, and use the site to share with others all that Mafair has to offer.